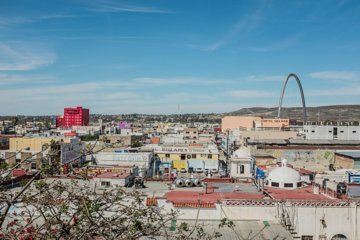 Explore Tijuana, Mexico, without getting lost on this day trip from San Diego, a great choice for first-time visitors. Visit cultural attractions, sample authentic Mexican street food at a sidewalk taco stand, and do some shopping and sightseeing. Opt to walk or take public transportation and experience the city like a local. Your guide can suggest stops and adapt the itinerary to fit the needs of the group. I was fortunate to have Umberto and Fernando as my guides for my tour of Tijuana. Umberto escorted me from the rendezvous on the US side through customs into Mexico. There, we met Fernando who took me on a wonderful tour of the city! Fernando's like a human Google; he seemed to know everything there is to know about Tijuana. We spent a long time in the Tijuana History Museum, then wandered through markets and shopping areas. We had a delicious agua fresca and some steamed tacos and I got to buy some touristy stuff. We ended the tour at a bar where we shared a beer and stories about our mutual interest, cars and driving.I couldn't have had a better time in the city. Thanks, Umberto and Fernando!!! Carlos was great. We felt safe walking around with him. He took us to more local spots than just tourist attractions which was very nice. Andres, was a great tour guide. He was knowledgeable, listened tentatively, and was very respectful. He was vey proud of his city and showed us the untypical sights. We did shopping in shops where the items were made in Mexico and of good quality. We saw the true culture of Tijuana, town square, cathedral, shops etc. thank you Andres. Tijuana was great and the quality of the handmade goods were like no other. All of Mexico is represented in one place. There are a lot of dental services offered here to border crossing Americans. The tour itself was friendly and casual and people were accommodating our broken Spanish. There were singers in the park and a festival at the cultural centre. It would have been 5 stars if the tour was structured with more history. Thankfully, a dress shirt shop owner gave us some directions to local, established, hand-made dealers.